LUCKNOW, India — As Narendra Modi gains momentum as the Bharatiya Janata Party’s candidate for prime minister, attention is turning to Muslim voters in the politically important state of Uttar Pradesh, who have been regarding him warily because of ties to right-wing Hindu groups that have attacked Muslims. Uttar Pradesh has 80 seats in the lower house of the Indian Parliament at stake in the national elections, the most of any state in India. Muslims make up around 18 percent of the nearly 200 million people in the state and have historically provided support for the governing party in New Delhi, the Indian National Congress, and the regional Samajwadi Party, which is currently running the government in Uttar Pradesh. Regional parties dominate Uttar Pradesh and could siphon off votes from either the Bharatiya Janata Party or the Indian National Congress so that neither gets an outright majority in the Lok Sabha, the lower house of Parliament. 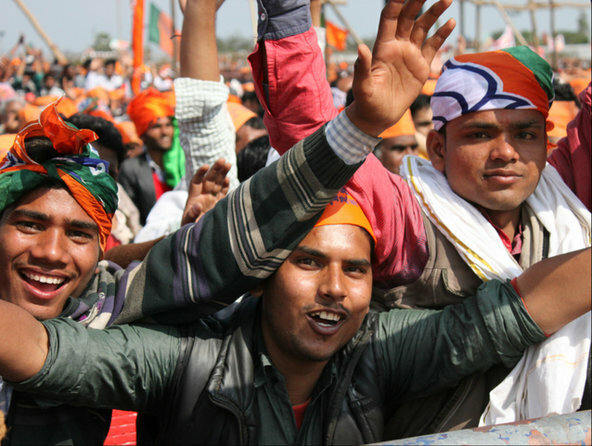 The Bharatiya Janata Party, or B.J.P., has won the parliamentary seat of the Lucknow district for the past several terms. Other districts in Uttar Pradesh are less settled. Winning over Muslim voters in Uttar Pradesh requires a more complex strategy than just fielding a Muslim candidate, because they don’t vote as a bloc and they don’t base their vote solely on religion. The Shiite-Sunni strife comes into play in places like Lucknow, where the division between the two communities is wide. Sunnis will do what Shiites don’t, and vice versa. The Shiite population is also generally regarded as more affluent and business-oriented than the Sunni population, and for that reason might be inclined to support the Bharatiya Janata Party, Mr. Susewind said. Mr. Abbas said his organization would announce its endorsement for prime minister in the next couple of weeks. S.M. Sabih, 38, an Urdu newsreader for All India Radio, said the Muslim vote would depend largely upon the mandate of clerics, who have their own political interests and don’t always align with the Muslim candidate. “Whoever the religious leaders support, the Muslim community will support,” he said. Prashant Bhatt, who works for the Bharatiya Janata Party’s election management team for Uttar Pradesh, said voting based on caste and identity would also be among the biggest hurdles for the party. Uttar Pradesh has a significant Dalit, or lower caste, population, and the Bahujan Samaj Party, which has its stronghold in the state, was formed to represent members of the lower caste. But the bribes that plague every election season overshadow the credibility of party workers, politicians, religious leaders and polling companies alike, said Syed Husain Afsar, an editor for anUrdu news site that attracts a predominantly Muslim audience. He said it was too easy to pay people to attract votes, or to create an illusion that voters, including Muslims, are swinging toward one candidate more than another. Mr. Modi clearly isn’t waiting around for Muslim voters in Uttar Pradesh to sift through the news reports and polls to make up their minds. He has visited the state eight times since announcing his candidacy last autumn. Local influencers are also doing their part to help his party. On the evening of Feb. 28, a trickle of people, mostly men, made their way to the third floor of the crumbling Lucknow Municipal Corporation building in the center of the city. A few members of the Rashtriya Swayamsevak Sangh, the ideological parent group of the Bharatiya Janata Party, had arranged what they called an “interactive session” with Muslims in Lucknow before Mr. Modi’s rally the following Sunday. 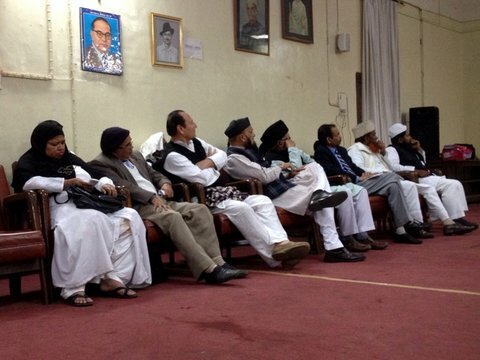 The meeting was scheduled for 6 p.m., but the organizers postponed its start until after the evening namaz, or Muslim daily prayer, to ensure a wide turnout. About 65 people were seated in the room when the meeting started just after 7 p.m., climbing to 92 at one point. In between, three members of the Rashtriya Swayamsevak Sangh talked to the crowd about secularism in India. “It’s as if the Ku Klux Klan decided to have an interaction with the blacks,” said Mohammad Rashid, 49, a Sunni activist and writer in Lucknow. He was sitting in the back of the spacious room where the meeting was held, quietly munching on cloves and watching a man wearing a topi, the kind of hat often worn by Muslims, walk down the aisle, shaking hands with people. Mr. Rashid said he attended the meeting to hear what the Hindu organization had to say, and because his friend had helped plan it. When asked whether he would support Mr. Modi, he didn’t say yes or no. He only sighed. Tariq Durrani, a Sunni Muslim who has been a Bharatiya Janata Party supporter for the past two decades and one of the organizers of the meeting, said he had to take the fact that anybody showed up as a success even though the turnout was much smaller than what he had hoped for. Sonia Paul is a freelance journalist based in Lucknow. You can find her on Twitter @sonipaul. This piece was originally published on March 6, 2014, on the New York Times.